I don’t know what it is about wax paper, but it makes me happy. Maybe it’s the old-fashioned feel, or the way it tears so nicely. The way it smells a bit like crayons, or, maybe it’s because it’s so inexpensive and useful? 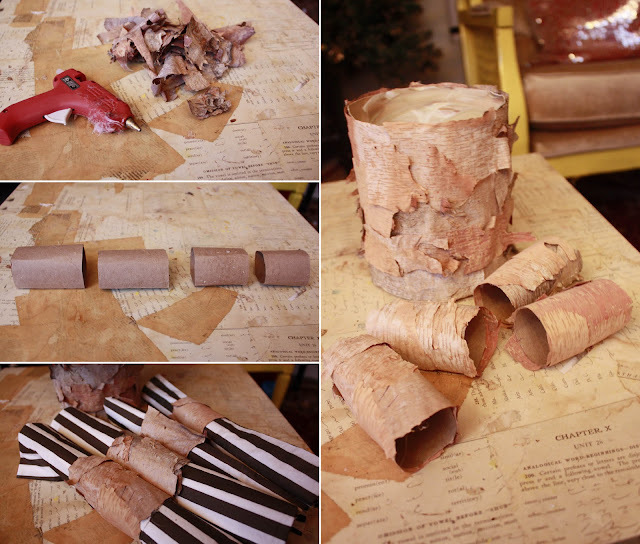 Some of my favorite childhood arts and crafts projects started (and ended) with a big roll of wax paper. When the folks at Pentel asked me to come up with something to celebrate Spring, my first I thought butterflies, then I thought wax paper. 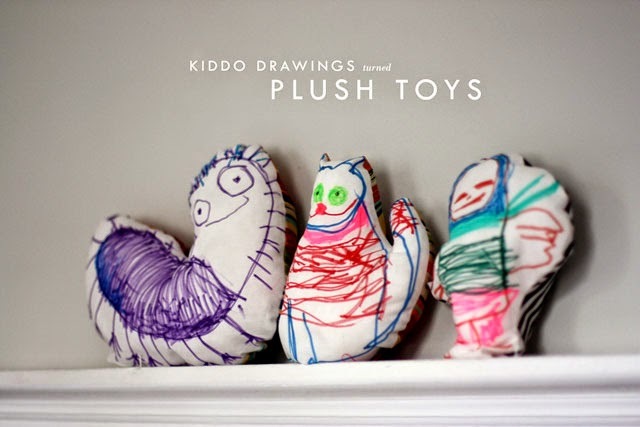 Throw a box of oil pastels and an iron in the mix and you have these awesome creatures. Go on and check them out! My 3 favorite words: Party. Pinterest. Crafts. What are you doing this Saturday? On November 15th, my favorite craft store, Michaels, is hosting a Holiday Pinterest Party. Everyone will be given a list of Pinterest-inspired holiday projects and an exclusive coupon to use when purchasing products needed to complete your project. To kick things off, Michael’s sent me a preview of list of the projects and asked me to create one using my own special twist. Challenge accepted! They made these really cute snowmen ornaments…I made a slush pot for sequins and crystals and glitter and sparkly things (don’t tell me you didn’t see that one coming). Awww. You can tell which one us was the kid who colored outside the lines. As much as I like the snowman (see Michael’s instructions here), I really like my project because it requires no special skills or craftiness at all. Little kids (and big kids) will both get impressive results. 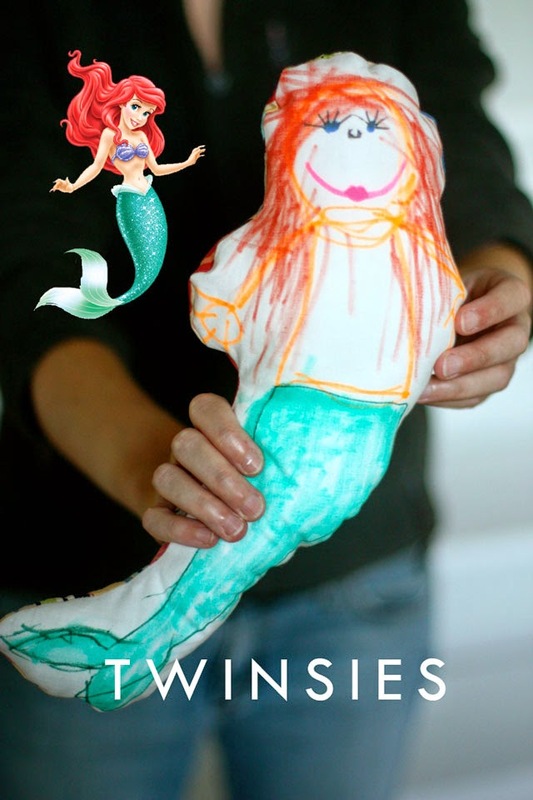 For that reason alone, this makes a great party craft, or class project. This is the kind of thing you want to make in batches. LARGE QUANTITIES. Also, nifty thing – the lid creates a sort of rimmed canvas for just about anything. Anything. Trinkets. Photos. What about a a ticket stub from a special trip surrounded by glitter and buttons? Or an old necklace that can no longer be worn? Break it up, glue it down, and mix in some added sparkles. This project is essentially just giving you a reason to buy filler sparkles. *A note about Mason jar lids. They usually come in two pieces — as soon as you lay down the glue here, it will sink in the crack and and after it dries they’ll be stuck for good. However, if you are working with kids who may not be the best at handling wet artwork, I’d smear a little glue and get them set up the night before. Instructions: To make these at home, all you need to do is brush the inside of your lid with a heavy coat of glue, then fill it with stuff. I like to put bigger items down first then fill in with sequins, but you do you. This is your ornament. When everything is pretty well in there, toss some glitter on top, then flip it over and dump all the excess glitter off and let it dry overnight. The glitter will stick to the little crevices of exposed glue but leave the rest exposed. Bam. That was easy, right? Hanging: To add the hanger, I wrapped a piece of floral wire around the rim then added and small loop for ribbon. If you are cooirdinated sort of person, you could skip that by punching holes in the side of the lid rim first, but I’m flying by my seat of my pants and hole punching is asking a lot before 11am. You could also hot glue some ribbon around the edges, or just to the back, but expect your ornament to flop over if it’s on the heavy side. Your call. Live dangerous. Or just use a pipe cleaner. Meh. Your call. Is it weird that I want to use one as a hood ornament? Hope to see you at the store Saturday! If you can’t make it in person and want to shop Michaels online, you can use promo code MERRYSALE for 40% off any one regular price item, now through November 15. I hate stuffed animals. Loved them as a kid, hate them as an adult. What age does that happen? I don’t know. But I look at them and all I see is a dust and germ jungle, stuffed with some asbestos fluff that fell off a building in China. You see a cute and cuddly, doe-eyed teddy bear; I see a death trap. HUG ME! Still, I appreciate that kids naturally flock to things they can squish and hold and anthropomorphize to their heart’s content. Which is why I like homemade dolls and stuffed animals quite a bit. I know where they came from. And even if I don’t know, I know that the item was made with love. I think that sort of attitude has trickle down benefits for all of — especially the kid. Hay now! Look at her little Ariel. This is way better than anything you can find at the Disney store. Best of all — these are super easy to do. You can whip out a couple of these in an hour. Sewing minimal sewing skills required. Go on now. Let’s get started! Good news: the grocery store finally started carrying giant chocolate bunnies. Giant chocolate bunny for dinner Spring is finally here! It’s been a while since I did a Friday Flower post. This winter has been too cold and gloomy to think of such pleasantries. But things are different now and I’m in the mood for flowers! Y’all know how much I love me some cupcake liners. 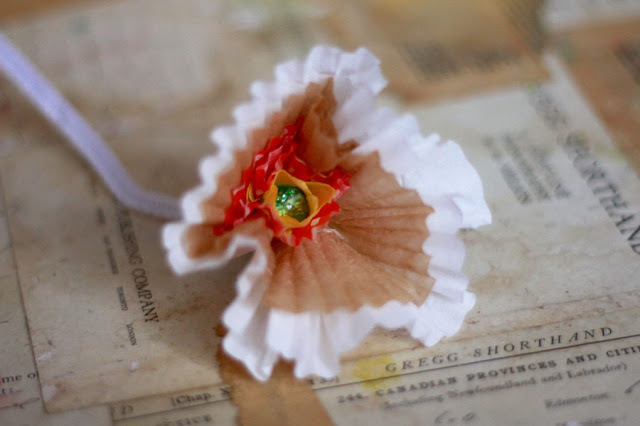 And even though there are some seriously nifty cupcake flowers out on the internet already (this one from Iceing Designs is my particular favorite! )…I thought I would do my own version. 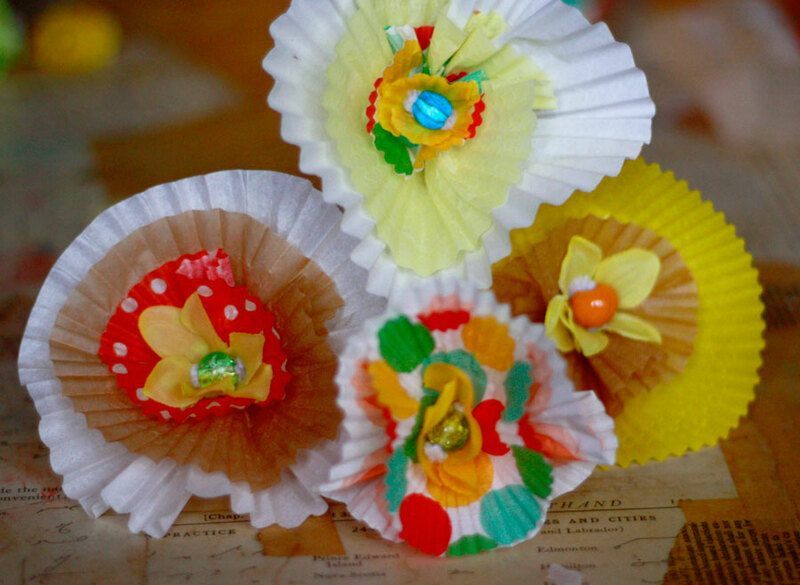 These are very easy, kid-friendly, and they scream HELLO EASTER! 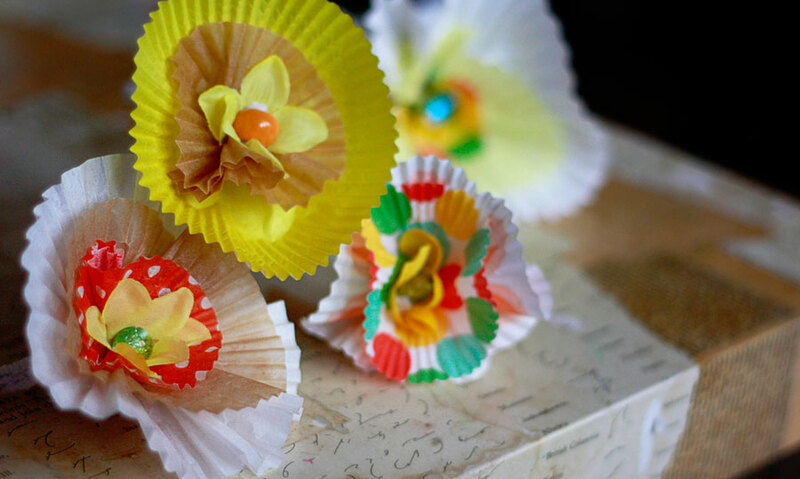 Various cupcake liners. Or muffin liners. Or nut cups. Or candy cups. Or coffee filters. Any ruffly cup things will do the job. Beads with holes large enough to easily accommodate pipe cleaners. Faux flowers. 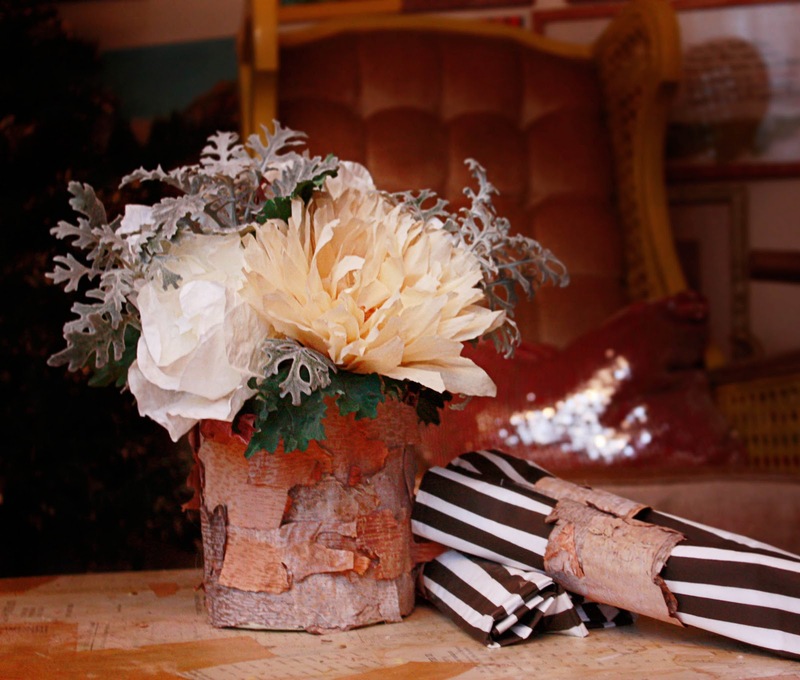 You could snip from fabric if you are anti-faux flower. Something pointy like an extacto knife or an awl. 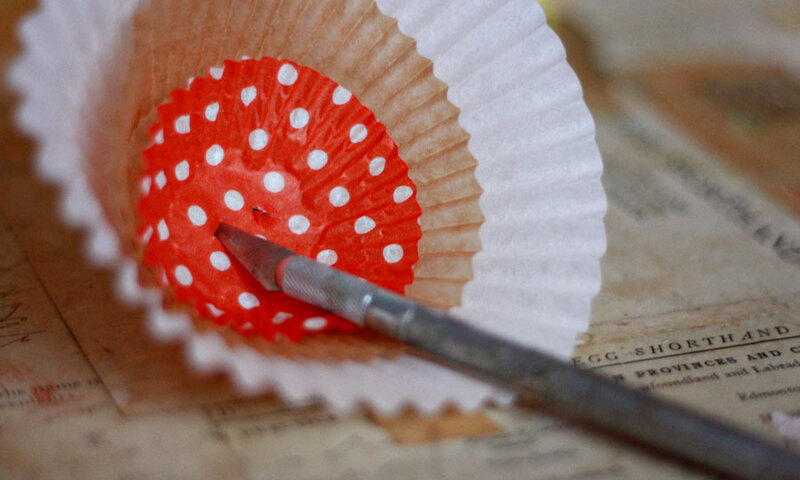 Stack up three cupcake liners in order of size, then use something pointy to make two small holes, roughly 1cm apart. 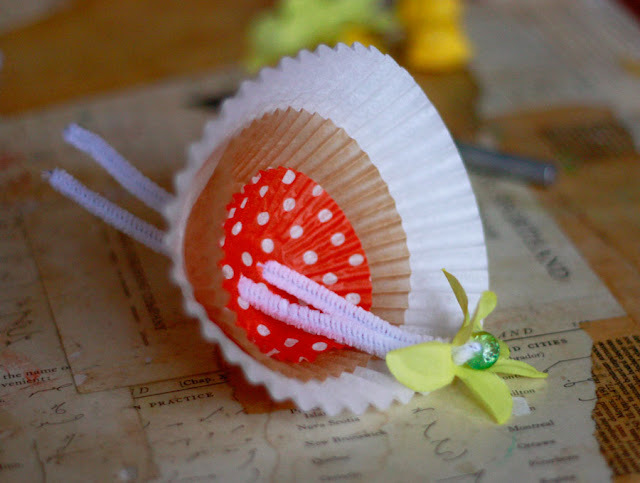 Thread the pipe cleaner through the bead, followed by the flower, then the two holes in the cupcake liner, pulling all the components together. 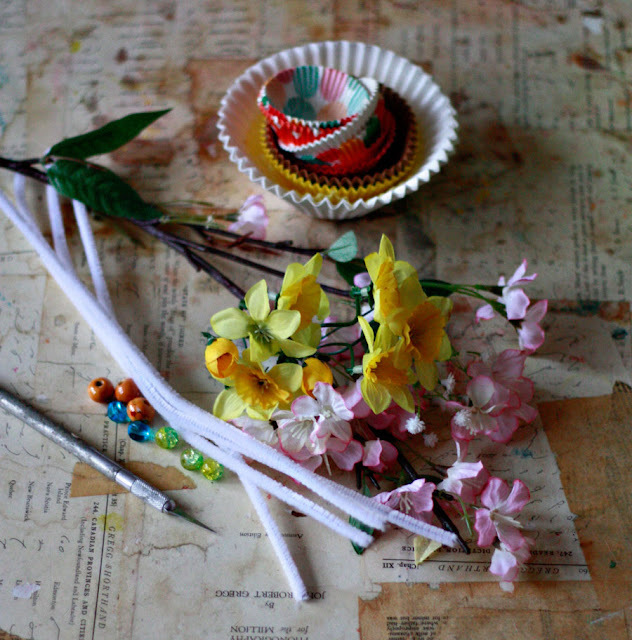 use one of the pipe cleaner stems to wrap around the base, then secure with a twist. That’s it! Gently pull back the petals, working from the outside inward. Fluff and repeat! You can churn out a bunch of these in no time at all. 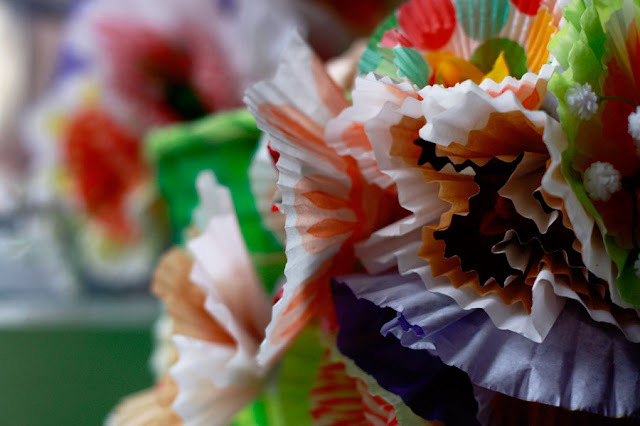 Wrap the flowers around wires or dowels to display in a vase, or just use the wire to wrap them around everyday objects. I keep a couple tied onto the wire basket I use to store onions. 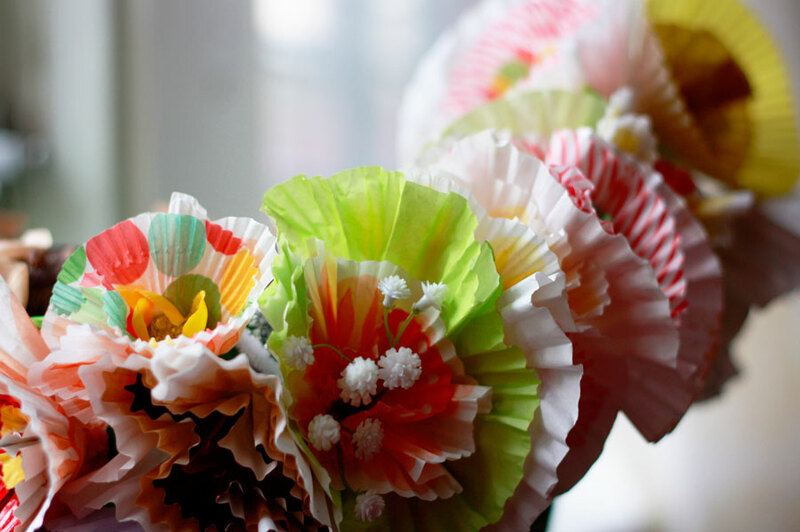 And listen, if my onions like these cupcake flowers, I’m pretty sure someone you know will like them too. Try them out for yourself! Stay Tuned…Monday I’ll show you my Cupcake flower Easter basket. Wahoo! I heart snow days. Literally. Tuesday’s blizzard meant spending Wednesday indoors having fun with Bird, eating frozen pizza and making all kinds of valentine fun, including these wonderfully dainty wax doilies. They are so delicate and elegant! Smell nice too. Most things come out of my craft studio covered in glue blobs and smelling like burning hair…these valentines must be Bird’s influence. Hearts made from melted crayons have been popular for a few years now, thanks to Martha’s tutorial. But as much as I love Maratha’s hearts, I’m too much of a klutz to follow the steps without breaking the end result. I decided it would be easier if there was softer wax and a sturdier base; enter paper doilies and scented candles. Heart shaped paper doilies, any size or color. My dollar store happened to carry pink, but white doilies will show off the wax the best. Wax shavings from scented candle stubs. Note: any old candle will work, but Ikea candles are dirt cheap and shred like butter–LOVE working with them. I also like to sprinkle in some contrasting crayon wax too. Plain white bar soap also worked, leaving opaque, snow like flecks. Experiment! 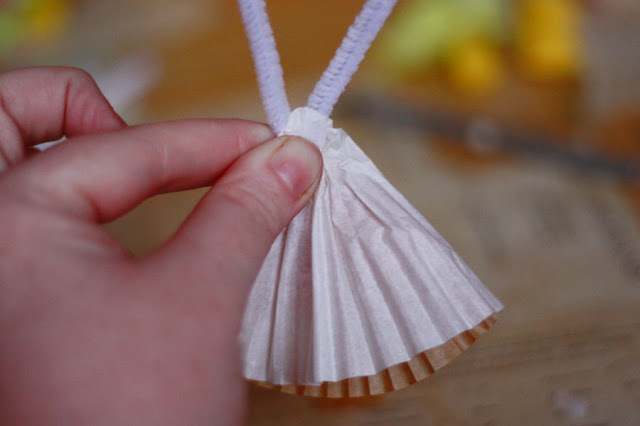 Sandwich your doily and wax shavings between two pieces of wax paper. Use a warm iron (delicate/low temp setting) to sweep across the surface. The longer you iron, the more the colors will blend. 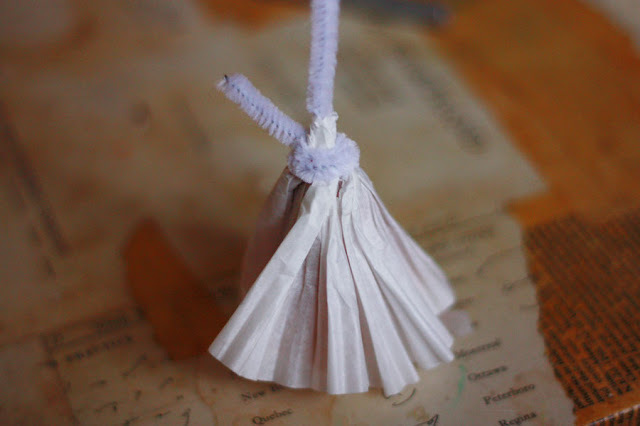 Before the crayon/candle wax has a chance to dry 100%, peel the paper doily away from the wax paper. Now, just look at that! Aint she a beauty? 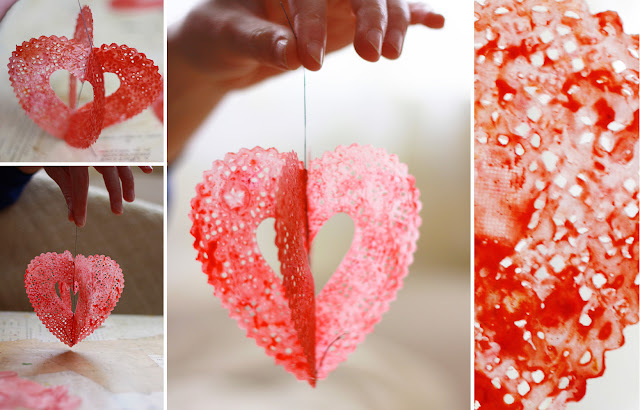 Repeat through your stack of doilies, then fold and cut out a heart in the center. Place two doilies together, then whip stitch up the middle. I used gray thread because I’m too lazy to dig through my sewing kit to find red thread for demonstration purposes. You go ahead and choose whatever color you like. If munchkins are involved, vertical staples will also get the job done. Or, keep them all for yourself. Like me! My plan is to hang these on a fallen tree branch, similar to an egg tree. Only problem is that all the fallen branches are currently submerged in four feet of post-blizzard snow drifts…so, it could be a while. Luckily I have many more snow day valentines adventures to make and share in the days ahead while I wait for a branch. Stay tuned! January, Dude, are you done yet? I don’t know about you, but I spend most of January stumbling through a gloomy funk. Somehow the daily grind gets much murkier when the snow on the ground is brown and the snow in the air is coming in sideways. Simple tasks that took an hour in September, can consume an entire day in January. The workload remains the same and yet I constantly feel overwhelmed. Why? If someone has the answer, please share, because I would really like to know. Well, I’ll tell you , the one thing I do know is that a lot of Creative Types struggle with this same issue, so I thought I would share one of my favorite rituals for combating creative funk: coloring. Yes, coloring. As in crayons. Seriously, try it. Look, it’s not going to replace Zoloft, but honestly, it can help. I’m not sure if it’s the smell of the wax or the rhythmic movements of moving the crayon across the page, but there is something about the act of coloring that clears my mind and puts me at ease. On days like today, when I am feeling especially dreary and overwhelmed, I rely on simple rituals like coloring to get me through the day. I cannot praise it enough. If you have kids then you probably already have supplies on hand, but if you are living munchkin-free, go down to the corner store and pick up a box of crayons! They cost about the same as a candy bar and can do a lot more good than you ever imagined. And, for those who are too old for coloring books, there is good news: you can make your own custom coloring pages! 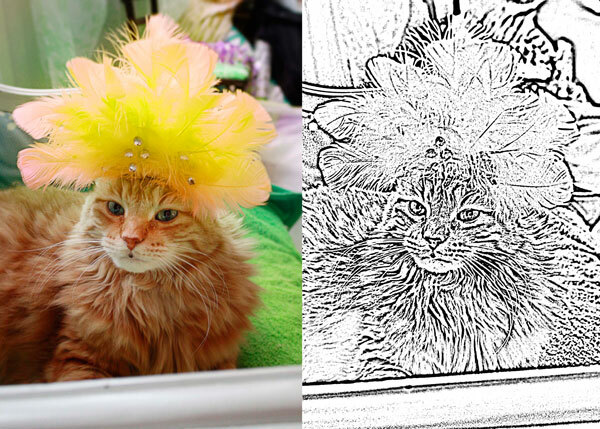 Simply upload your digital photo to Crayola’s free and nifty online tool, or follow these Photoshop directions. 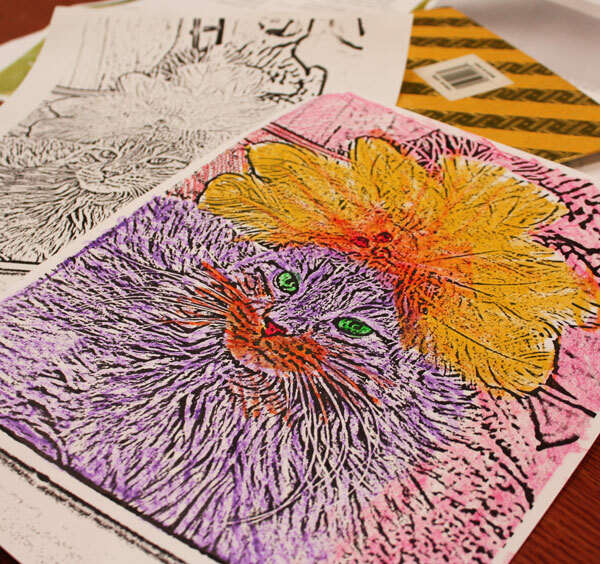 You are two clicks and a jiffy away from super keen coloring pages. Huzzah! I feel like a cheater for posting a project like this. It’s not like I invented salt dough or anything special. I’m not even making anything that hasn’t been done a hundred times over, either. I’d feel more entitled to write a post on how to make a decent peanut butter sandwich. However, even though salt dough has been popular since the dawn of time, it sure seems like every year I find someone who has never made it. Not when they were a kid, not with their own kids. They are living salt dough free. Let us show them the light! Salt dough is oodles of fun for munchkins and adults alike. It’s cheap, easy, fun, and with the addition of water-proof varnish, it can last for years. Los of people I know (myself included) have salt dough ornaments and hand prints and figurines from when they were knee-high to a grasshopper. You can do your research to find variations on the recipe, I will take mine directly from my Grandmother Pumpkin recipe. Mix together to form a ball. Bake 250 for one hour or until hardened, or air dry 48 hours. * Translation for Non-Southerners or Irish-People-Who-Bake-Too-Much: “biscuit cut” means use a jar or a glass or a empty tin can, or cookie cutter to cut the dough in circles. You can also use a simple butter knife and get creative. For colored dough, add food coloring, Kool-Aid, or paint into the water before adding it to the dry ingredients. Or you can paint your creations after they dry. If you want your ornaments to last, spray them with varnish, or, if you REALLY want to be sure they last, you can do like my third grade teacher and dip them in a quart of outdoor strength polyurethane. Those suckers will stand the test of time!